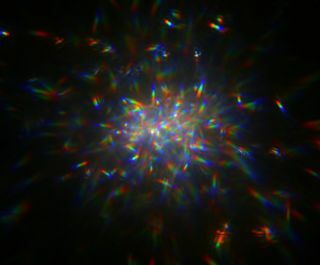 Image of laser light reflected off a glitter mirror onto a camera sensor. This work was performed as a part of the Orbiting Rainbows project for space telescope mirror technology. Using clouds of glitter to reflect light could be a way of reducing the weight of future space telescopes, scientists say. The technology, called Orbiting Rainbows, would cause particles to behave like a floating mirror, which would be much less heavy than the solid mirror typically placed in a telescope. Since the "mirror" would weigh less, it would require less fuel to send telescopes that are equipped with the technology into orbit, thus reducing the cost. The system, which is still under development at JPL, would move and trap a cloud of millions of "glitterlike grains" with several laser beams. The photons of light in the laser beam would push at the cloud from different directions, aiming to align the grains in the same direction. With this system, it's possible that the Orbiting Rainbows system could have a larger aperture — the spot where light passes through — than conventional telescopes. This NASA graphic shows how a glitter cloud in geostationary orbit could be illuminated and controlled by lasers to serve as a giant space telescope mirror to spot exoplanets. The project concept is known as the "Orbiting Rainbows." The trade-off is image distortion, because mirrors are more finely honed to reflect light than a cloud of glitter would be. To get around this, researchers are working on computer algorithms that would examine several images and remove the "speckle effect" the glitter creates. So far, the idea has been tested in the laboratory — but by spreading glitter on a conventional concave lens. A team led by co-investigator Grover Swartzlander, an associate professor at the Rochester Institute of Technology, used the "glitter mirror" to look at a simulated double-star system. The team also took several pictures and successfully processed them to show the two stars. A laser-trapped mirror was first proposed in 1979 by astronomer Antoine Labeyrie at the Collège de France in Paris. Before deciding on the current design, the team also considered basing the novel technology on common light-scattering structures found in nature, like rainbows, clouds and comet tails. The technology is funded under NASA's Innovative Advanced Concepts program — a division for new technologies that could be used in far-off future missions — and was selected for Phase 2 funding in 2014. If the technology is ever tested in low-Earth orbit, the researchers plan to send up a telescope with only a small cloud of particles that would be about the size of a bottle cap. If light reflections are successful, they would then attempt imaging.